Good morning! Yesterday I took my Peace Pole to UC Medical Center where I teach meditation to staff and patients (mostly staff attend). The Peace Pole represents each of us. Peace begins within. I provide its history and that when each of us brings peace to ourselves, we reflect that back out. We all can feel peace. The Peace Pole is a fabulous physical representation to remind us. Like it, we remind others of Peace when we are peaceful. 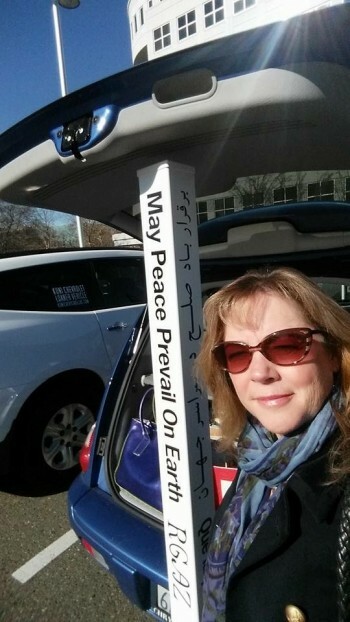 I take the Peace Pole to speaking engagements, yoga classes and who know where else? I’m open. I love how it speaks so well for itself and is spreading the words, May Peace Prevail on Earth. More people become aware of this prayer, are speaking it, being it and purchasing their own Peace Pole.